Halloween is the unique time of year when we get to revel in the macabre and enjoy a good scare or two. The Irish coast is full of myths and legends so we’ve put together a few of our favourite terrifying tales, unexplained phenomena and scary stories from the Irish coast. In July of 1878 the residents of the seaside town of Ballycotton, Co. Cork witnessed something astounding. They gathered on the shore and gazed in wonder at a new island that had suddenly appeared off the coast. They claimed to be able to see various features on the island such as woodlands, mountains and valleys. 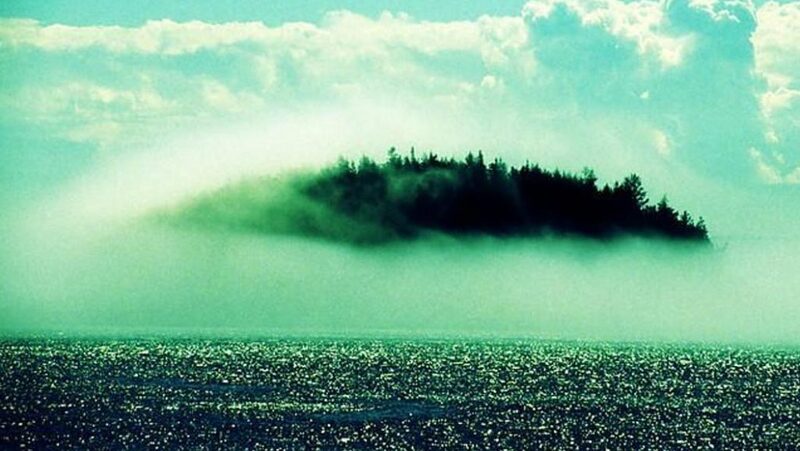 Several fisherman took to their boats to explore this mysterious island but as they approached the island faded into thin air. This strange anomaly has also been reported by several other coastal towns along the west coast. Was it a mirage or an illusion? Or could it have been the legendary island of Hy Brasil, the promised land. Sought by Brendan the Navigator, this island is said to be hidden from human eyes and only becomes visible for one day every seven years. Irish folklore is full of fantastical monsters and legendary beasts. But none are more fearsome than the Dobhar Chu. This ‘waterhound’ has a penchant for human flesh and is said to be seven-foot long, the size of a crocodile, resembling both a dog and an otter. It’s agile on water and on land and has a haunting screech. On the 24th September 1722 Grainne Ni Conalai was washing clothes at the waters of Glenade Lake, County Leitrim. Her husband heard her screams and came rushing to her aid. But he was too late, the Dobhar Chu had got her and the beast lay there resting on her bloody body. The man stabbed the beast in its heart. 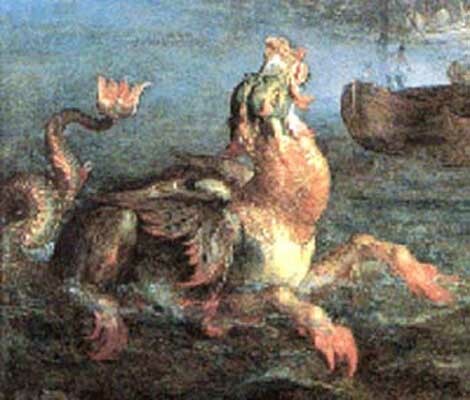 Its piercing shrieks awoke another beast sleeping in the water. It came for the man and he fought a bloody battle and managed the kill the second monster. Grainne’s headstone can be found in Conwall cemetery in Glendale and depicts the image of the beast that ended her life. Sighting and attacks have been reported throughout the centuries some as recent as 2003 when a couple claimed to have spotted one off Omey Island in Connemara. Few things can be scarier than true horror. And horror and a hellish nightmare was what those poor unfortunates who dared to flee the country during one of the darkest periods in our history faced. From 1845 – 1852 the Great Famine decimated the country. Throughout Europe a blight ravaged the potato crop but nowhere suffered the effects as much as Ireland. A third of the population was dependent on the crop and they were left with little choice – leave or die of starvation. Over 1 million people fled the country hoping for a new life abroad but not all made it. The ships they travelled on became aptly known as Coffin Ships. The mortality rates were high and around 30% of passengers never made it. The journey by sea was a hellish nightmare. The conditions were horrendous – hundreds of desperate people were crammed in the ships with little consideration for their health or comfort. 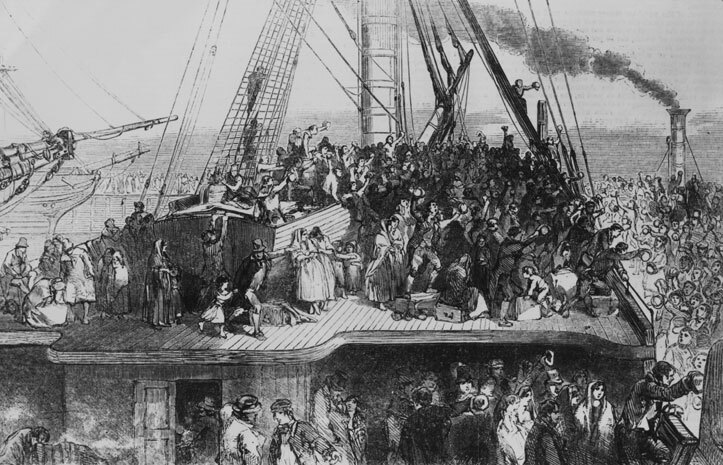 Death and disease were rampant and the cruel ships owners gave scant rations of food and water to the passengers. There was violence over rations, people lived in filth and their loved ones and friends died around them. The dead were afforded no luxury and were quickly disposed of over the side of the ships. Brave John McNeill Boyd and his men lost their lives in a final heroic act to rescue others. During one of the most severe storms ever recorded on the east coast Boyd and his men ventured out into the storm to aid vessels that had got into trouble on the rocks off Dun Laoghaire pier. Sadly an enormous waves surged over them and they were lost to the sea. Several days later Boyd body washed up on shore and his dog, a Newfoundland, was present when the rescue crew recovered his body. The dog followed his master to his final resting place at St Patrick’s Cathedral in Dublin. The faithful companion lay down on his owner’s grave and refused to leave. Eventually he starved and died next to his master. The ghost of Boyd’s dog has been witnesses many times at the Cathedral sitting at the memorial statue to his captain or lying on his masters grave, guarding his master for eternity. During a stormy night a ship docked near shores of Loftus Hall on the Hook Peninsula, Co. Wexford. A dashing stranger called to the hall looking for shelter from the storm. Lord Tottenham and his family welcomed him in and he stayed several nights while the storm raged outside. Lord Tottenham’s young daughter Anne began to fall for the dark handsome stranger. She became close to him and they talked all day and by night played cards by the fire. One night Lady Anne dropped a card and leaned down to pick it up. Under the table she saw the cloven hoof of the stranger. She screamed and the stranger exposed for the Devil that he was immediately disappeared through the roof in a ball of hell-fire. The event left Anne traumatised and she never recovered. 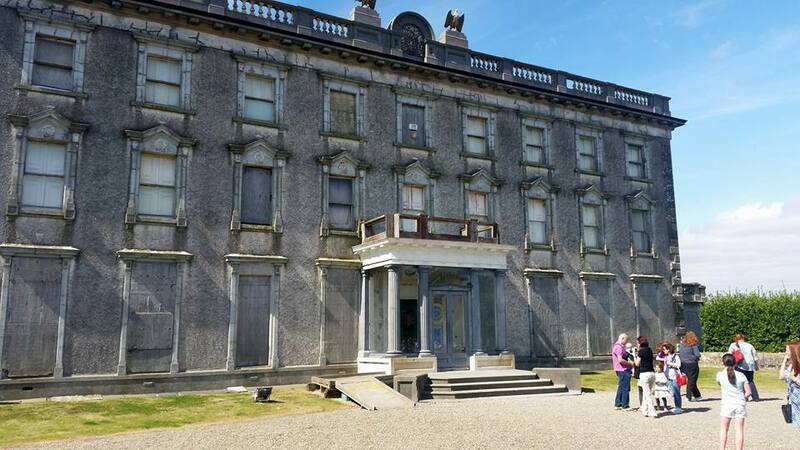 If you visit Loftus Hall today you can see the hole left in the roof from the devil’s departure! On the morning of September 22nd 1884 the HMS Wasp was sent on the less than savoury task of ferrying police and bailiffs to the small island of Inishtrahull off Donegal to evict three poor families. 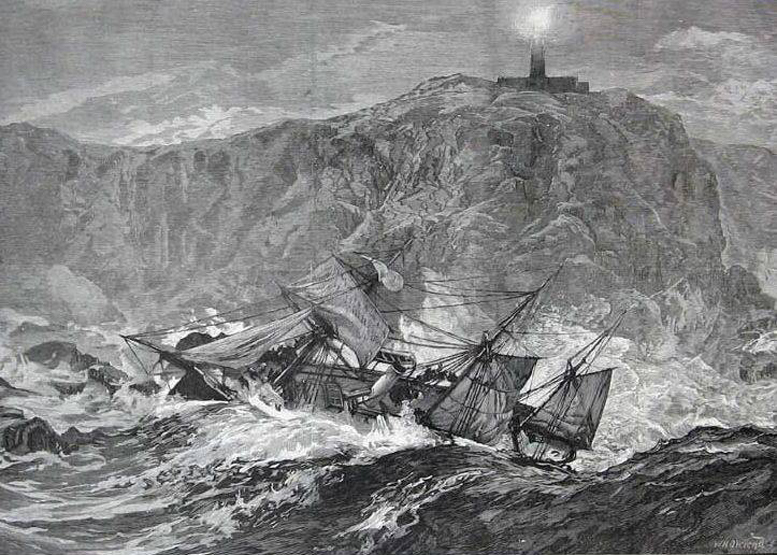 But the ship would never reach its destination and was dashed on the rocks below Tory lighthouse. The truth of what exactly happened still remains a mystery. Was this just a tragic accident or were there dark forces at work? After the wreck rumours spread that there was a curse laid on the ship by the islanders using the islands cursing stone Cloch na Mallacht or Cloch Thorai. The origins of these stones date back to pagan Neolithic times. The story goes that it was feared the ship was coming to evict Tory Islanders so the stone was used to place a curse upon the ship. A local priest is said to have been disgusted by these pagan claims of curses. He became enraged and is said to have taken the stones and thrown them over the cliff.